Posted: Tue May 17, 2005 12:06 am Post subject: Ended: The A-Wing Vs. Tie Interceptor concept contests. Hello again fellow FBTB members� Sorry for the delay once again, I was too busy as of late, but as promised, we continue the contest mayhem. Anyway, as a LEGO project I thought the idea is great for all of us to dig in and start coming up with some new fresh design ideas that allow builders to show some of their building skills. Every contest will be focusing on a specific vehicle from the OT movies. The choice of such vehicles will mostly be determined by me, since I�m the host. I have already assembled a line of judges that will help me out running these contests series and they are some of the most gifted and respected members around, and it�s a great pleasure of mine to work with them as a fan and as a friend. Keeping in mind that they could be replaced with new judges if someone chooses to step out for any personal reasons. We will have a simple line of rules that will be applied on each contest. Those rules will be displayed in the announcing posts for you to follow� Each contest will have three different scaled categories for you to enter, where you can participate only one entry for each category. Hopefully those contests will keep your building enthusiasm on the rise for the next couple of years or so. One winner only will be chosen and rewarded for each category, but for that to happen, each category must have at least four valid entries. In other words, no prize will be given if a particular category has less than four different entries. - C) Or you could enter both vehicles, and still you could win a third prize. (The best combo entry)... Neat, ha? It�s your choice and your challenge. -Try not to do something over-drastic where people cannot identify the vehicles at all. People should recognize what you are building, either if you choose to enter the cool Interceptor, and/or the very fast A-Wing fighter. But still you can be as abstract as you want to a certain degree. -Use only true unmodified LEGO elements to build your creations. No cut, painted, brassoed, modified pieces will be allowed. -CAD based creations are allowed. -If you chose to enter in the minifig scaled category, please try to use a minifig piloting the fighter. -Try to use some decent uniformed color schemes, remember we are not building rainbows with wings. -One winner will be chosen in each category for each contest. -You cannot enter the same model in the other categories. Duh! -Each winner will be rewarded with a nice LEGO prize. -Only links please, do not embed images. -Judges can enter to win too� But if a judge decides to enter in a certain category, he will be forfeiting his position as a judge for that particular category. -I will announce the prizes later on. -Remember that: The Minifig/SE scaled (where you can fit minifigs in most of the vehicle in an appropriate position). The MINI scaled (too small for any minifg to fit in). - The deadline: July 20th 2005. The judges for this contest are: Darkkazmo, RevB, Warhawk, and ThePaleMan. can they be variants of the fighters? Or just the basic ship in people's perspectives. count me in. manomanoman I'm excited! 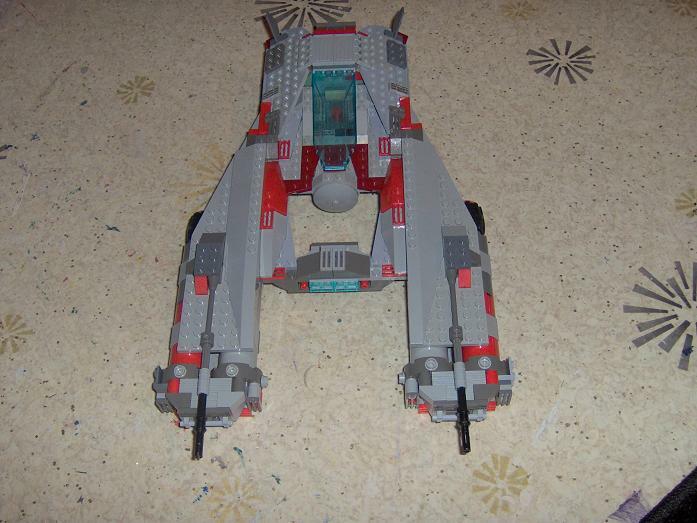 and without further ado, my entry for the minifig scale A-wing (and potentially for the combo contest as well). I'll just assume for now thhat older models are OK as the rules did not exclude them, although, technically the rules do state all those old TIE's from the first contest cannot be entered as TIE Interceptors. ::D: hope you guys left some ideas in your heads. I'm not a fan of entering previously created models in contests, but if it is allowed, I have something that could be A-Wingish. If not, I better get building! while I would normally agree, I believe this model, and my X-wing/Naboo starfighter hybrid, were inspired by this contest and in anticipation of further contests, as this series of contests was originally supposed to follow along each other and eventually every ship was to be part of the contest. in other words, I didn't build a model and go "oh, it looks sorta like an A-wing, so I'll enter it" (although I have done so for other creations in other contests, where it too was not against the rules), it was designed as an A-wing concept. I don't have much time to build and don't get as many ideas as I'd like, so when I get them, even if I'm thinking ahead, I build them, and post them. sure, I could hold onto the pics for a while, but I'm just not the type to do that. besides, its important that enough of each model of each contest be entered so each contest gets enough entries. does that make since? but if Joseph tells me its out, then I'll take it out. its up to him- he's the judge. hmm... As tempting as this seems I just might have to stick my foot in the door and join in on this contest although due to lacking of parts i might only be able to do an A-Wing . C'ya in a few months when I feel safest to post my creation Muwahahahahaha! *caugh* . Whew, good thing this wasn't a Y-wing contest, because I demolished what I had of a Y-wing alternate yesterday. while I would normally agree, I believe this model, and my X-wing/Naboo starfighter hybrid, were inspired by this contest and in anticipation of further contests, as this series of contests was originally supposed to follow along each other and eventually every ship was to be part of the contest. That sums it up guys, some of those models that EJ did, were PMed to me a long time ago in advanced for these type of contests! I agree that he happened to post them a bit too early, but they were made initially for these contests. I personally will allow them, but if the other judges disagree here, I would have to drop them. These contests are basically a team collaboration, and I am just one part of the equation. Again, thanks for the anticipation people, and just let them roll. I wasn't taking a dig at you personally gold. The comment was more aimed at myself . Sorry if it came across that way. heres my contribution. hope you like it. Aaaaargh! I built a cool alternative TIE fighter a couple months ago, and tore it up for parts a week ago! iunno if this is kewl to enter a second model, but i made this tie interceptor a long while back. Location: Brain is currently unavailable. Please leave your message after the beep. Yay! Me put in first MINI'S! I've entered under all 3 catagories in the MINI division. I'm pulling out, lest I gather the patience to use some CAD program for this by July or encounter some awesome sales before the deadline. Pity I can't take all 20,000 pieces of mine with me when I go on vacation for the next 2 months. edit: It's not working, I'll need to upload them to brickshelf. edit AGAIN: well, for some reason it's working again. Am I going crazy? This is my entry into the contest, at the "Mini" scale. The A-Wing starfighter was considered to be a fabulous success by the Rebel Alliance's experienced fighters due to it's superior mobility when compared to starfighters the empire would use. It found great success in space-based engagements, but limited use due to the skill required to pilot this model properly. However, in atmospheric conditions the A-wing faired poorly. It lost much of it's additional mobility, and problems with the shield array creating significant drag resulted in the removal of the shield assembly from A-wings expecting to see significant atmospheric fighting. This removed a major advantage in larger engagements, where sheer volume of fire would reduce the effectiveness of the improved speed and maneuverability. To counter this, Dodonna-Blissex developed a redesigned A-wing for use in atmospheric conditions. This A-wing was made for multiple roles, including air superiority, ground attack, and bombing. Two bombing bays were added with the room saved from the removal of the shield generator assembly, and the entire design was streamlined for use in atmospheric conditions. The first bombing bay was designed for propelled style bombs to be fired from underneath, near the cone of the ship, while the second bay located at the rear would drop gravity-driven bombs. The first bombing bay could also be refitted to hold more ammunition for the concussion launchers, or to carry anti-tank weaponry. Upon seeing the success of the new Atmospheric A-wing (or Atm-Wing), Sienar Fleet Systems immediately stepped up it's research program on developing a TIE (Twin Ion Engine) fighter for use in atmospheric conditions. The Tie Interceptor was chosen as the basis for this research due to it's improved aerodynamic stability and fire control. In battlefield conditions, TIE craft such as the TIE Fighter almost could not operate in atmospheric conditions. The combination of wing design and typically inexperienced pilots resulted in sharp turns at high speed that would cause the wings to shear due to wind resistance. While considered by some captured Rebels to be amusing (and the last amusing sight of their life), this loss could have been avoided by a more role-specific craft. This, Sienar Fleet Systems systems developed the TIE-Interceptor-A for use in atmospheric conditions. This model elongated the rear portion of the wing span and reversed the seating of the wings to give better stability. The wings are also designed to operate in a closed position for fully atmospheric conditions, increasing the streamlining and eliminating the possible shear that could occur. This model mounts two power laser cannons and two ion cannons, because when you're fighting in an atmosphere, a loss of control will almost always prove fatal. Additionally, to match the speed of the A-wing, a larger, more efficient engine assembly was used in combination with more powerful generators. Landing struts were also added to the design, in the case that the deployment mechanism should fail or be damaged in combat. Finally, because the new wing deployment mechanism required the removal of the fire control system from each wing base, a central fire control was added just forward of the landing struts. This redesigned starfighter provided the traditional flight power of a Tie Interceptor in space, a vastly improved atmospheric performance, and the ability for an inexperienced pilot to use it with proficiency in an atmosphere. Finally, because I have both, here they are together. I should have some time soon to do some better looking action shots, and may photoshop it a bit to add some effects (laser/ion shots, etc) if that is allowed. Let me know what you think, comments on how to improve are ALWAYS welcome. Well i have th description of it here.